Finally a kitchen before and after to share with you all. 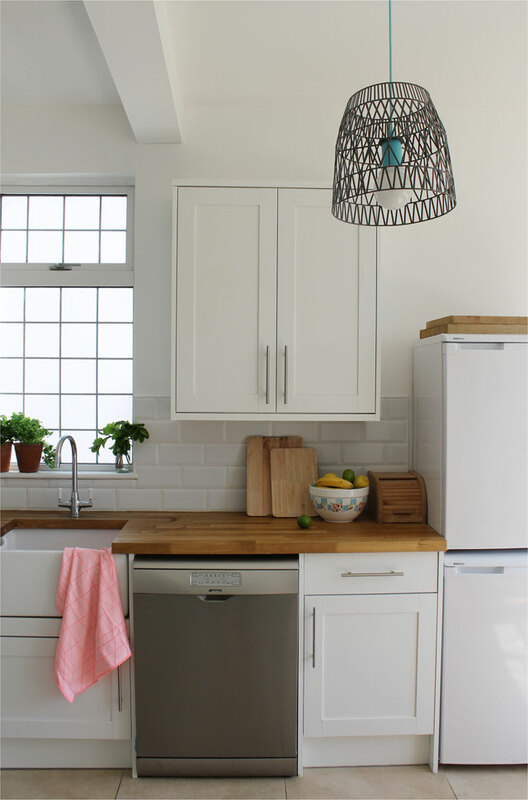 You might have seen a few glimpses of my kitchrn on my Houzz home tour but today I'm going through what we did and learnt along the way. Before we started the renovations the kitchen it was a small maze of rooms; a tiny kitchen, shower room and bedroom. The main family kitchen was upstairs (see bathroom makeover for details) so we had to create the kitchen from scratch. 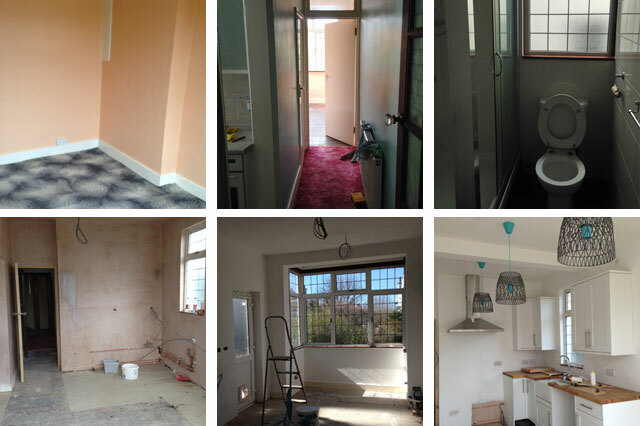 We approached the room in two stages, part one was creating the new space and part two was fitting the kitchen. The first big job was to make the space bigger, we took down the wall between the shower room and bedroom and also knocked through into the dining room - this created light and space so we could then see what we were working with. I make this sound very straight forward but there were unexpected discoveries along the way like a gas pipe running down the centre of the newly created room that we had to redirect and making sure a half removed fireplace was removed completely (sob!) so the house above properly supported. We used a local building firm to do all the work for us, they've since gone bust so I can't recommend! The second stage was fitting the kitchen. We ended up getting our white units, work top and cooker hood from Howdens. We'd used them previously and the quality is good for what you pay. We had someone from the design team come and draw up a plan for the layout of the kitchen but I wasn't happy with it. We had been given a secondhand range cooker from my auntie and my cousin had given us a dishwasher that we needed to work around, the plans they drew up were too awkward. I then got a second more bespoke company in to have a look, I wish we had been able to use them for the whole kitchen but sadly they were way over budget. They drew up a more practical plan which we ended up using (I still feel a bit guilty about it). The new plan meant that the newly installed gas pipe and a few electricity sockets had to be moved. In hindsight I'd have made sure we were happy with the layout before we started but time and budget was against us. The main piece of advice I'd like to pass on when it comes to building is make sure you cover snagging issues and finishing touches. We naively thought that if the builders were putting a in door they'd put the frame in too - wrong! 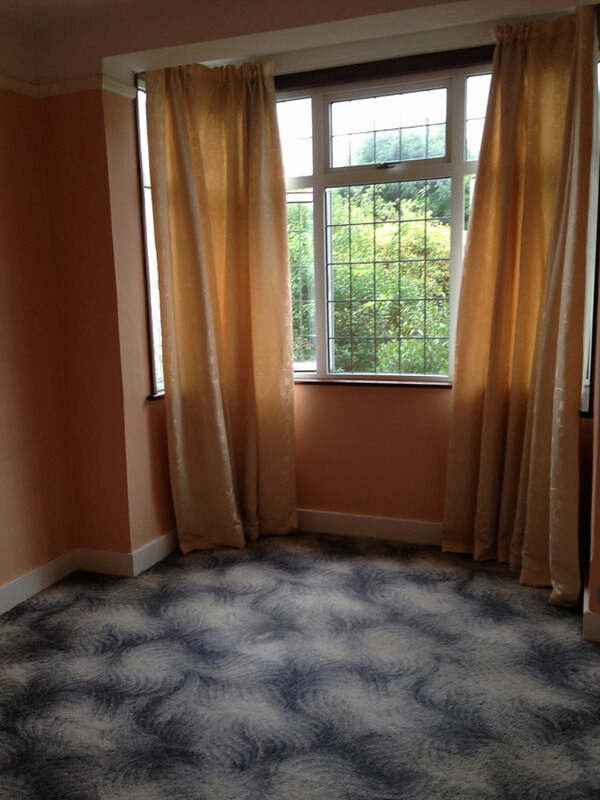 We thought skirting boards would be attached and replaced - wrong! We thought that the electrician would make sure the electrics works properly - wrong! Make sure you write down exactly what is expected before you start the work and don't lose the piece of paper. There are a thousand decisions to make along the way and its easy to lose track if like us you're working full time alongside the project and not on site everyday. Some good decisions we made along the way were having free standing units. 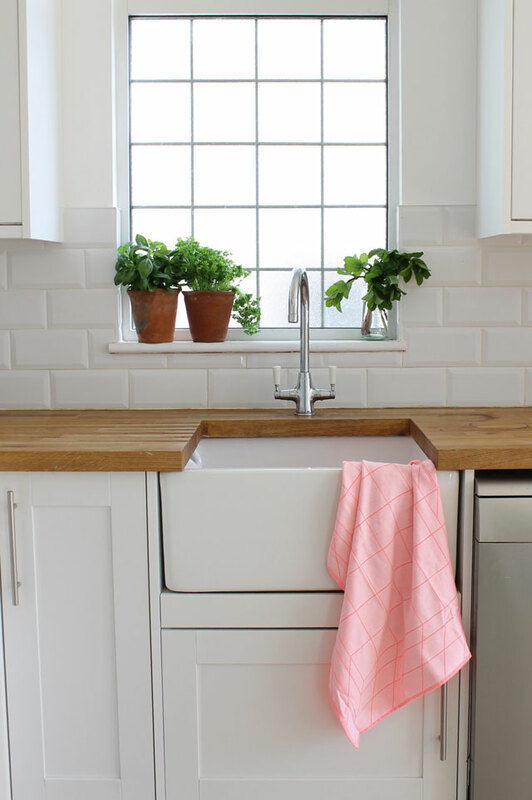 I really wanted a free standing look, but the more I researched the more I realised that having an effortless eclectic kitchen was so expensive. If I'd had the time and someone to assemble - I would have liked to have sourced units with more character. Unless you can do the hard work yourself then you'll need to find a builder that shares your vision, I found that recycling isn't top priority and the fact that we were using anything pre-owned completely freaked everyone out! I did manage to find two great units on Gumtree, whilst they are not my total dream, they are working really well. In the bay there is a big oak (veneer) sideboard, which has plenty of storage plus a top that I don't mind getting dirty when I arrange flowers, plant seeds or paint on. The second is a bench underneath glass fronted cabinets which I used for everyday items and cook books. 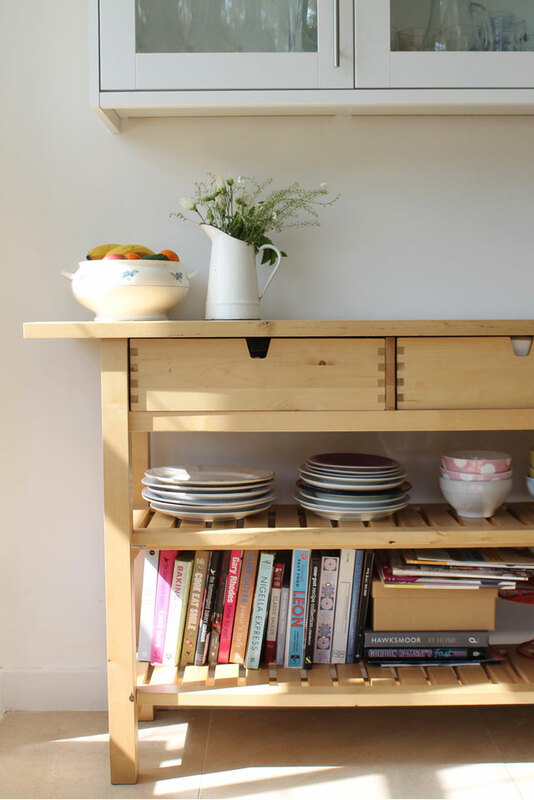 When I was researching kitchens I really liked the open shelf look but I hate cleaning so compromised with glass fronted cabinet for our glasses and vintage crockery and went for opening shelving with our everyday items. Again its working really well and dirt hasn't built up as everything is in constant use. Before we started we were offered loads of advice (wanted or not). There was talk of "they say you should do this...or...that!" which we totally ignored. 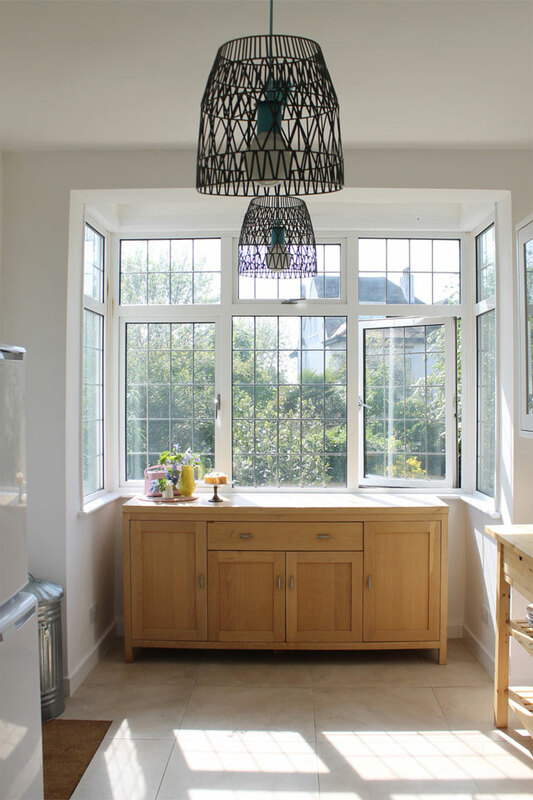 For example our bay window looks out onto the garden, we didn't want to ruin this space by using it for a sink which we knew would just get stacked up with dirty dishes. Having a practical space that can be used for messy projects is much more useful to us. There was also much talk of little breakfast tables and breakfast bars. As neither of us had breakfast at home and the dining room is only a mere three meters away we opted to keep the space simple. Our worst habit is piling up post so any unused surface becomes a dumping ground. I'm glad we didn't always listen, whilst the kitchen isn't exactly as we would have liked it works for us and doesn't take too long to tidy up, which again was something we wanted to make sure of. We spoke about our good and bad habits and planned the room accordingly, we know that our needs will change as our family gets bigger but having flexible space really works when on a budget. I hope this shows you that you can compromise and still create a room that works for you. We had to really use our imagination as we were completely changing the use of the room in a house we hadn't lived in. Unless you have plenty of money and can work with professionals then I'd say keep everything as simple and flexible as possible, there is always room to add or take away once you start living in the room. I hope I've covered everything but if you have any questions please ask. 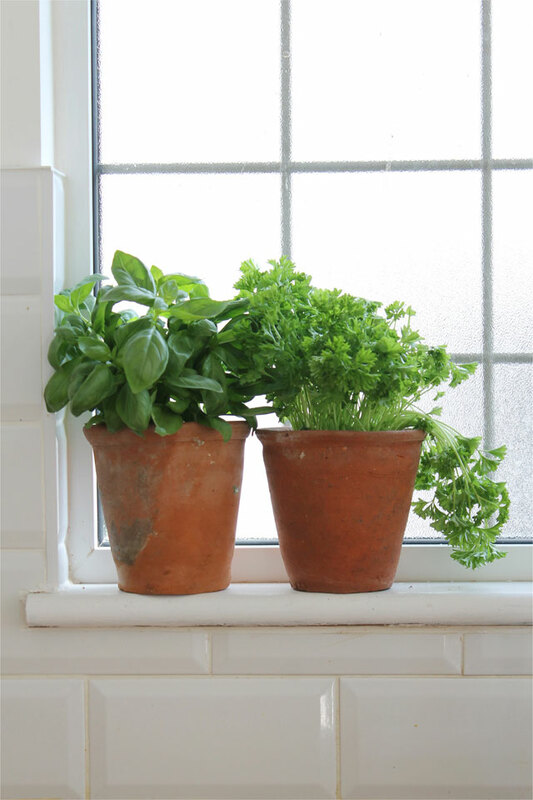 I've put all the shopable links below and you can see my Pinterest kitchen board here. What a great adventure ! 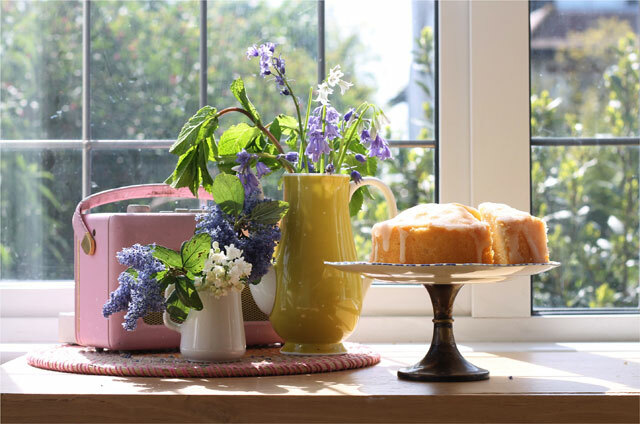 I sometimes think decorating a house is a bit like being a mum, lots of compromise, ups and downs, from your dream home - child and having to face what you may change and what you have to accept ! But both can change and evolve according to many things to take into consideration. Hopefully dad are here to help - specially if they are good a DIY (with lego as well as tools !). I like the simplicity you've put - it never goes wrong; great for accessories !!!! It looks really good. And you gave some good advice throughout. I especially liked what you said about the accounting of extra snags along the way. The only way to curb that is to work with really good people, who're always impossible to find. I suppose if you are not in the construction business, swapping houses, etc. you wouldn't know. the designs is looking really awesome. thanks for sharing,life is not easy, live at this moment,relax urself, more useful information and fun activity on cincinnati body rubs, u can find what u want，u will see ur sunshine again.